Born: 5 August 1878, Necton (near Swaffham), Norfolk, England. Arthur Stead, the son of Arthur C. Stead, was educated privately. In 1895 he was awarded a senior Norfolk county scholarship and in 1899 obtained the degree Bachelor of Science (BSc) in physics and chemistry at Victoria University, Manchester. That same year he was awarded a Liverpool University College studentship to study chemistry and in 1904 obtained a second BSc degree at that Institution. He was elected a Fellow of the Chemical Society and has been credited with originating the "permanganate lime process" for purifying water supplies. On 14 April 1903 he married Annie B. Harwin of Norfolk, with whom he had at least one son. Stead came to Natal Colony in 1900, during the Anglo-Boer War (1899-1902), and in 1902 was employed in the Department of Education of the Transvaal Colony. In October 1904 he joined the Public Health Department of the Orange River Colony (now the Free State) as assistant to the government analyst and bacteriologist in the Government Laboratories, Bloemfontein. In 1908 he was appointed also as an examiner in chemistry for the colony's chemists and druggists' examination. He became a founding member of the South African Associatio of Analytical Chemists (from 1921 the South African Chemical Institute) in 1912. In October 1913 he moved to the Cape Province to take up an appointment as research chemist and lecturer in chemistry at the Grootfontein School of Agriculture at Middelburg, Cape Province. Stead wrote "Notes for farmers on the soils and waters of arid countries" in the annual Report of the Orange River Colony Department of Agriculture (1907/8, pp. 26-36), followed the next year by "The cultivation and reclamation of 'brak' or alkali soils" (Report, 1908/9, pp. 31-37). In 1905 he became a member of the Philosophical Society of the Orange River Colony and served as its honorary secretary from 1906 to 1909. 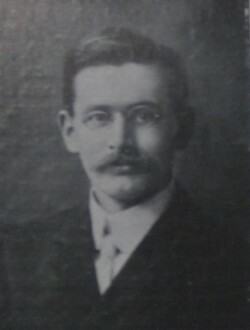 He contributed two short papers to the society's Transactions (1903-1907, Vol. 1): "The application of flocculating percipitants in the purification of water for potable purposes" (pp. 67-70), and "The natural waters of the Orange River Colony from an agricultural standpoint" (pp. 71-72). In 1904 he joined the South African Association for the Advancement of Science, served on its council for 1909/1910, and as president of Section B (which included chemistry) in 1923. During these years he contributed several papers to the association's annual Report and its successor, the South African Journal of Science: "Chemistry and crops" (1910), "The use of wood ashes for manurial purposes" (1912), "'Loog-as', or the ash of the alkali bush" (1915), "Humus, humogen, and its accessory plant food substances" (1916), "Plant toxins, a cause of infertility in soils: A South African observation" (1917), "Twenty years of chemical progress in South Africa" (1923), "Saaidam terraces in the Karoo" (1924), "Note on the fructifying action of heat on the pineapple" (1925), "The determination and application of the electrical resistance and pH value in irrigation soil surveys" (1928), and "The deterioration of pineapple soils" (1929). Other publications by him included "Some chemical reflections concerning lamziekte" (Agricultural Journal (Union of South Africa), 1913, Vol. 5), "The agriculture and soils of the Cape Province" (Ibid, 1920, in 5 parts), and "Analysis of soils from the Kalahari" in Report of the Kalahari reconnaissance of 1925 (pp. 60-63). In 1921/2 the soil survey of the Union of South Africa was instituted as an integral part of the Division of Chemistry (then headed by C.F. Juritz*) of the Department of Agriculture. Stead was transferred from his post at the Grootfontein School of Agriculture and placed in charge of the soil survey. However, his headquarters remained at Grootfontein until 1925, when the survey was moved to Pretoria. Between 1915 and 1939 he wrote over 20 internal reports, most on soil investigations all over the country (and some on sewage disposal) and between 1915 and 1928 published a number of articles on soil chemistry and other agricultural topics in the serial publications of the Department of Agriculture. After the death of his wife in 1927 Stead married Nellie A. Payne, who survived him. Civil service list of the Orange River Colony, 1905/6, 1907, 1910. National Automated Archival Information Retrieval System (NAAIRS). . Documents relating to Stead, Arthur. South African Association for the Advancement of Science. Report, 1905/6, 1910, 1912, 1915, 1916, 1917, 1918. South African Journal of Science, 1923-1929, Vol. 20, 21, 22, 25 and 26. Union of South Africa, Department of Irrigation. Report of the Kalahari reconnaissance of 1925. Pretoria: Government Printer, 1926.